Little T had roasted butternut squash for lunch yesterday. He thought it was pretty awesome. So awesome, in fact, that he gave a little cheer. 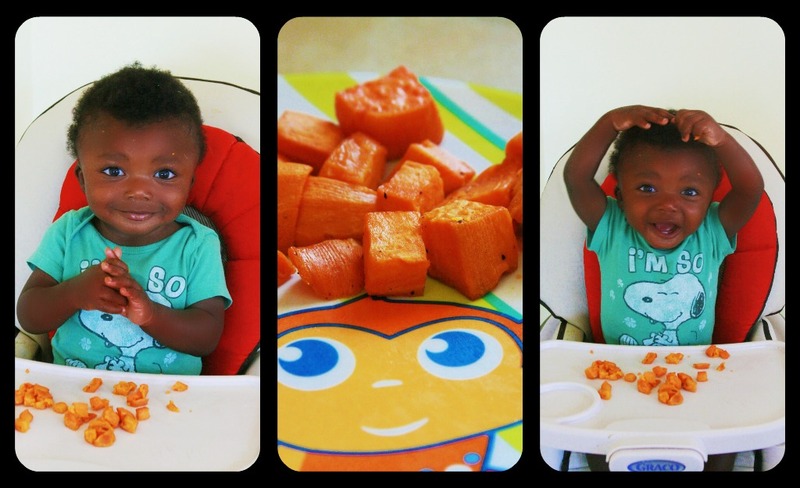 The butternut squash is a nice meal because it’s soft and yummy and he’s able to pick it up with his little fingers. I can also make a lot of it at once and save the rest for snacks or later meals. It’s also easy to make. Can a baby be healthy on a vegan diet? Yes, of course they can! Little T was in the 1st percentile when he entered our lives, and now he’s grown into the 86th. Our doctor said little T’s as healthy as can be. He’s only had one cold, which I think is a pretty good track record for such a social butterfly who spends lots of time with other babies. Long Term Veganism for Little T? We don’t ever want Little T to feel like we’re forcing veganism on him. When he’s at our house and with our family, we’re going to cook the way we always cook and eat the way we eat. When he’s with a friend or at school and they have an ice cream party that we didn’t know about and weren’t able to prepare for, we don’t want him to feel bad or left out. We think he should decide if he wants to try ice cream and learn things for himself. I’ve known vegan kids who turned vegetarian, were adamant vegans, and who grew up to eat meat. Who knows how Little T will turn out, but We hope that he’ll grow up loving healthy food and that he’ll understand the reason his parents eat the way they do. If we succeed at that, then I think we’re doing something right. Thank you! I learned to be that way from my mom. She’s been vegetarian/vegan since we were little, and raised us the same way. I turned out to be a committed vegan, but my brothers switch back and forth. I think it was good that she gave us the option and let us figure things out on our own.